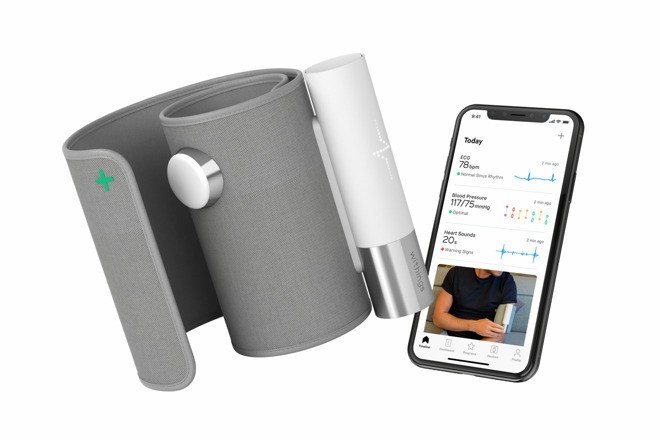 The Withings BPM Core is a three-in-one monitor, providing measurements of a user's blood pressure, taking an ECG reading, and being capable of listening to the heart via a digital stethoscope. Strapping to the upper arm in a similar way to a standard blood pressure monitor, the device is able to perform all three measurements within 90 seconds. The cuff self-inflates for the blood pressure measurement, tracking and monitoring the systolic blood pressure, diastolic blood pressure, and heart rate measurements, with instant results shown on the included LED matrix display. The screen also provides traffic light-coded feedback for the user's normal, moderate, or high blood pressure readings. For the ECG, which can also detect AFib, users have to place the hand from their free arm onto the stainless steel sensor for 20 seconds. The digital stethoscope element requires a sensor to be placed on the user's chest for 20 seconds, again with results displayed on the device. Readings and results are also sent to the iOS Health Mate app for further examination and as a record of changes over time. Withings is aiming to ship the BPM Core in the second quarter for $249.99. Currently, it is under review for FDA and CE clearance due to being a medical-grade device. 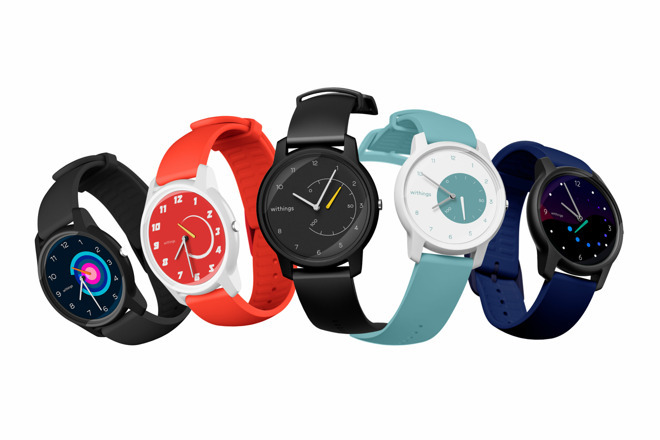 Withings' fitness trackers typically include a simple analog watchface, such as with the Activite series, and new models aim to further the concept. Named Withings Move, the stylish analog watch follows the same format of embedding a fitness tracker for monitoring activity and sleep, with the only real clue of its smart capabilities being the use of a 0-to-100 gauge to show progression towards a fitness goal. For Move, Withings has refreshed the design to give users more choice, with five initial color options when it goes on sale in the United States, and with additional designs launching every month and on special occasions. Additional options include different colors, cases, glass types, and wristband materials, though later in the year there will be options for users to specify their own custom version via the Withings website. As with earlier Activite models, the Move can recognize daily activities including running, walking, swimming, and for the first time cycling, with sessions recorded into the Health Mate app along with other data. The onboard sleep tracking can analyze sleep patterns including length, depth, and quality, with a Smart Wake-up to rouse users at the most optimal times during their sleep cycle, and can provide extra data on depth regularity and interruptions. Pre-orders for the Move are now open in the United States, priced at $69.95, with initial shipments expected to start on February 5. 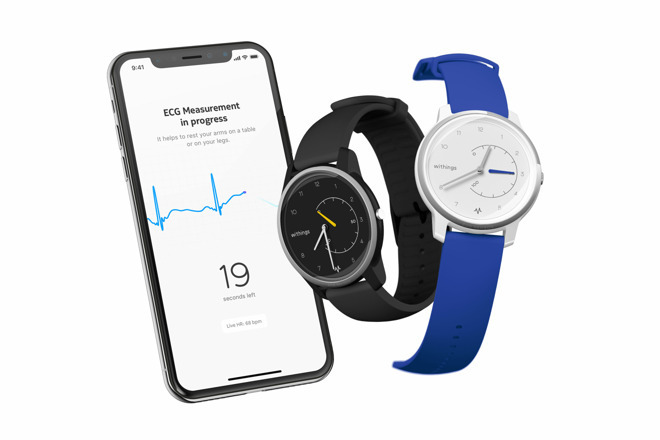 The Withings Move ECG takes the concept even further, by expanding the functionality of the analog watch fitness tracker to include electrocardiogram readings, which can help detect heart conditions such as atrial fibrillation (AFib). To take a reading, users have to contact both sides of the stainless steel bezel to start an ECG recording. After less than 30 seconds of measurement, the watch vibrates to alert to the reading's completion, which is then synchronized with the Health Mate app on an iOS device. The app provides more detail about whether the heart is beating in a normal pattern or if there are signs of AFib. Users also see a detailed graph of long-term health rate trends and ECG readings, with the data able to be shared with a doctor or healthcare professional for more advice. At the same time, the Move ECG contains the same fitness and sleep tracking features as the Move, complete with water resistance of up to 50 meters and up to 12 months of battery life. Withings advises the Move ECG will be available in white and black watchface options from the second quarter, priced at $129.99. A variety of wristband colors and material options will also be available to personalize the wearable devices.